Teen Trend: Do You Know About JUULing? There is a deceptive new way for teens to get a nicotine buzz and it has nothing to do with tobacco or a pack of cigarettes. It’s called JUULing and its a popular new way for kids to vape. The devices are turning up in school hallways and bathrooms and can easily be concealed. The nicotine transport devices can be as small as a flash drive, and often look like one. This allows teens to hide them in their hand. Some students being as crafty as to use the device right in the classroom. A recent forum on this trend recently drew more than 200 people to sessions at the Deerfield Public Library and at Highland Park High School. The forums were sponsored by Community The Anti Drug, a coalition working to reduce drug and alcohol abuse among youth in Highland Park, Highwood, Deerfield. Riverwoods and Bannockburn. According to Truth Initiative, each of the pods of liquid nicotine contained in these devices is the equivalent of 200 cigarette puffs, or about a pack of cigarettes. Adding to the concern for health experts, the liquid nicotine can be substituted with liquid cannabis or other addictive drugs. The marketing of this product involves the nicotine being made to smell sweet or fruity and not offensive like cigarette smoke. Experts say kids as young as ten are trying it. Although it is advertised that you must be over 21 to purchase the device. One downside: the cost. A JUUL starter kit, which includes a USB charger and a four pack of pods, costs about $50 from the online company. Refills cost about $16 for a four pack. A Spokesperson for JUUL Labs, the manufacturer of the device, says the company wants to “eliminate cigarettes by offering existing adult smokers a better alternative to combustible cigarettes. No minor should be in possession of a JUUL”. 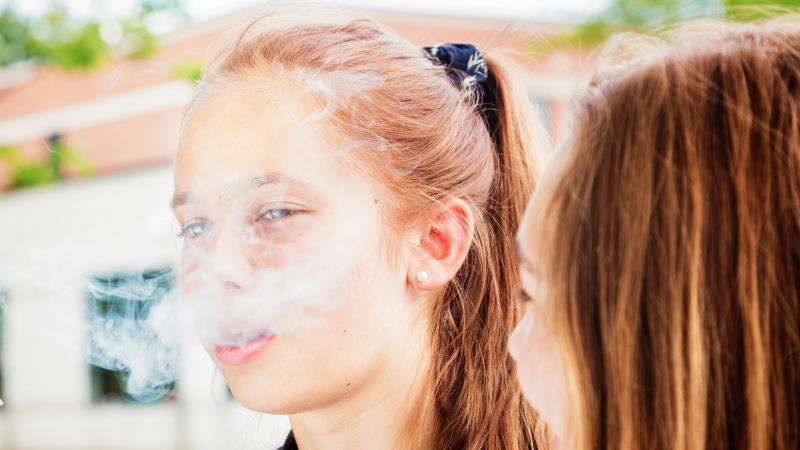 The American Academy of Pediatrics warns that the growing teen brain is just as likely to be impacted both short and long term with a vaping device as it is with any other tobacco product. The American Lung Association says it can lead to a condition called Popcorn Lung. That’s scarring of the lungs that can lead to Chronic Obstructive Pulmonary Disease or COPD.